Trembling, short of breath, a highly emotional Audrey Tautou wore her heart on her sleeve before the guests at the opening ceremony of the 66th Festival de Cannes, as if she was emerging from an emotionally charged screening. She came onto the stage of the Grand Théâtre Lumière with the microphone pressed against her chest to pick up the beat of her racing pulse. She spoke to the hearts of her audience. "Hearts that are ready to be charmed, moved, amazed, stopped, whether or not they are all decked out for the occasion, hearts here and elsewhere, hearts that have loved cinema ever since the day that a film, the first one, transported them to seventh heaven." She said that for her, that film was E.T., and this strange creature "that kept on repeating Call home, call home". 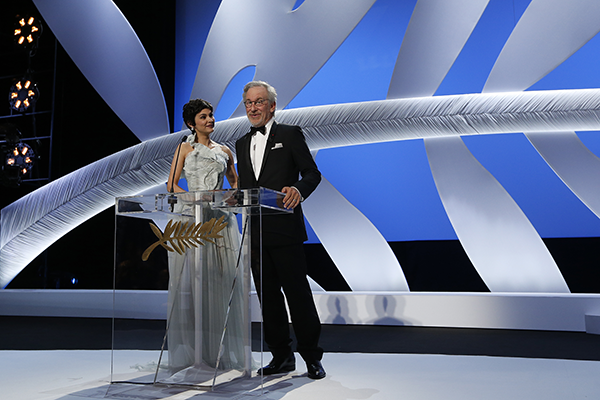 The segway is perfect, and Steven Spielberg joined the mistress of ceremonies to a standing ovation and a reaction from the president of the Jury: "Mon Dieu", in French if you please! Applause also for the other members of the Jury, and an ovation for the retrospective on the now mythic sound tracks of Indiana Jones and Jurassic Park among others. After a very jazzy and soulful rendition of Sister, the song taken from the original sound track of The Color Purple, Amitabh Bachchan accompanied Leonardo Di Caprio on stage. The leading man in The Great Gatsby had the honour of making the traditional pronouncement at the start of the Festival: "I declare that the 66th Festival de Cannes is now open." Then Audrey Tautou gave her final words, wishing all the festival-goers "a collective tachycardia", before letting their film-loving hearts plunge into the magic of the seventh art.